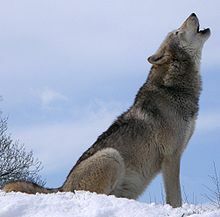 Sciblogs | Can howling like a wolf make you feel happier? As a scientist I often come across journal papers that show weird and wonderful science I wish I had been involved in, either because they are totally bizarre or they are super cool. Realising that many of these articles sit in the cobweb filled archives of an online library somewhere, dreaming of seeing the light of day again, I’ve decided to dedicate my new weekly science show on Kiwi FM to discussing science that I think is a little bit different. Today was the first show of the weekly series which will go out at 7:40am on Wednesday mornings and the first study that caught my eye was a study published in the journal Psychological Reports titled “Effects of laughing, smiling, and howling on mood“. In this scientific study the researchers were interested in the effects of forced laughter on mood and compared laughter with two other possible mood-improving activities, smiling and howling. The participants had to perform 60 seconds of broad smiling, 60 seconds of forced hearty laughter, and 60 seconds of howling. Why on earth would anybody do this? Well there is a whole series of research that shows laughter can be theraputic, and it may improve immune function, help lower blood pressure, and reduce stress and depression. It doesn’t have to be genuine funny laughter to see these effects, and forced laughter will work just as well, so with the thought of alternative treatment options, researchers wanted to know if anything else could show the same effects as the physical act of laughing. Turns out laughter really is the best medicine and it came top of the mood boosting acts, followed by smiling which also had a positive effect. Howling however, did not substantially improve mood in this study, although I think that if I was forced to howl in a room with other people for 60 seconds, I’d end up in fits of giggles, so I still think howling can be good for you. It seems that adults laugh on average only 18 times per day compared to 5 year olds who laugh on average 8 times per hour so if there is anything to take away from this study is that its time to go back to our childish ways of going outside to play and laugh more.